Artist's impression of the cellular structure of part of the retina in the eye. Mueller glial cells (white) which provide architectural support and help maintain the integrity of the retina are highlighted here. Rods and cones are photoreceptors found in the outer layer of the retina, responsible for vision at low light and colour vision respectively. The outer segments of these photoreceptors (various colours; top of image) and their cell bodies (red) are depicted here. Horizontal and amacrine cells (green), bipolar cells (blue), displaced amacrine cells (purple) and retinal ganglion cells (copper) are also visible. 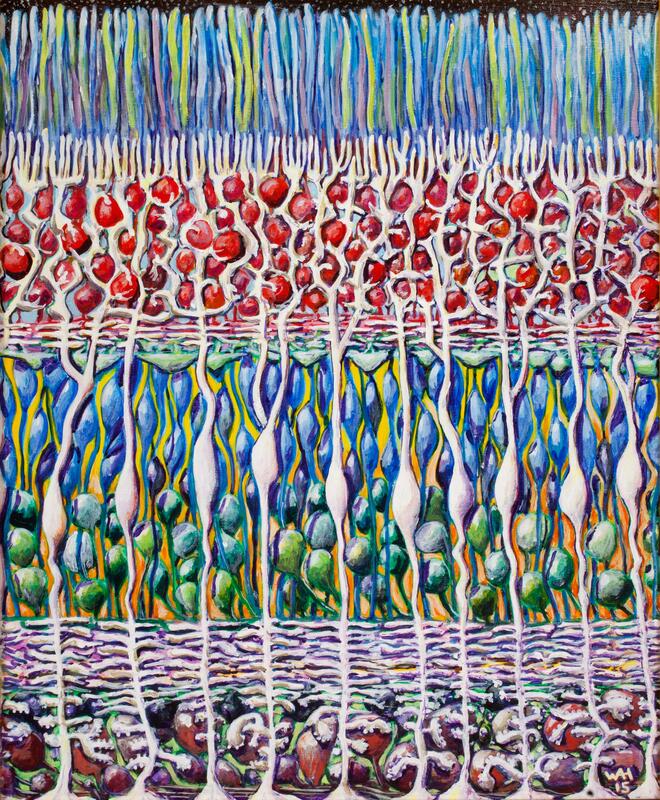 This acrylic painting was inspired by multi-coloured fluorescent proteins which are used to label different types of cells and different compartments inside a cell (e.g. nucleus, membrane, cytoplasm). This gives an instantaneous view of the spectrum of cell fates within the retina.